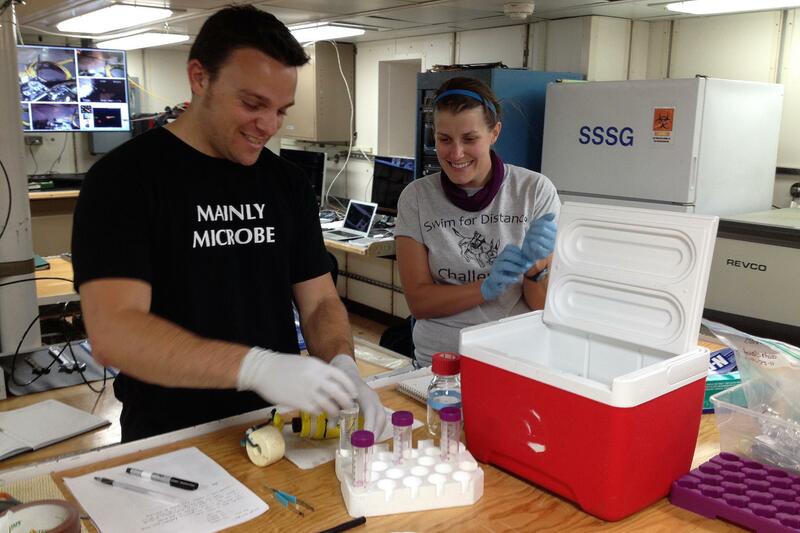 Stephanie Carr, at right, works with a student to process deep-sea samples aboard the R/V Atlantis. Credit: Beth Orcutt, Bigelow Laboratory. 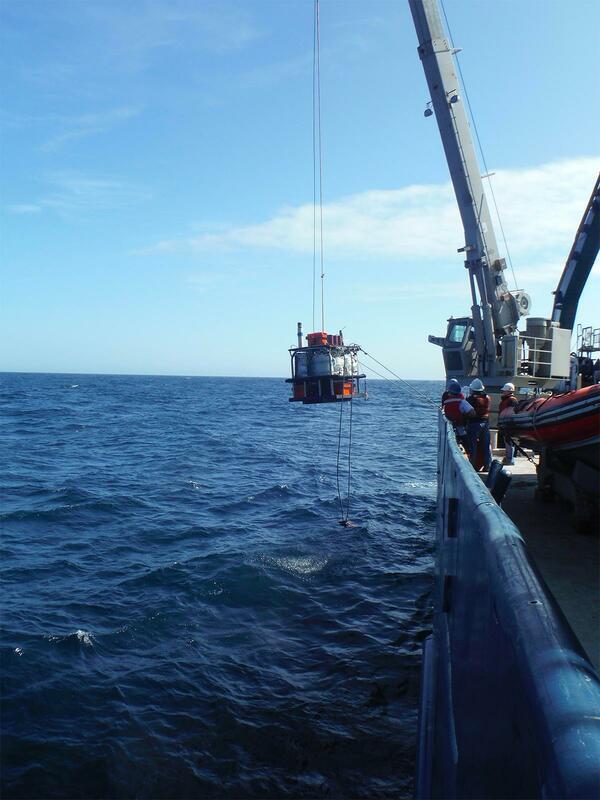 Recovery of fluid samples and instrumentation from deep subseafloor of Juan de Fuca Ridge flank, aboard the research vessel Atlantis. M. Rappe photo. 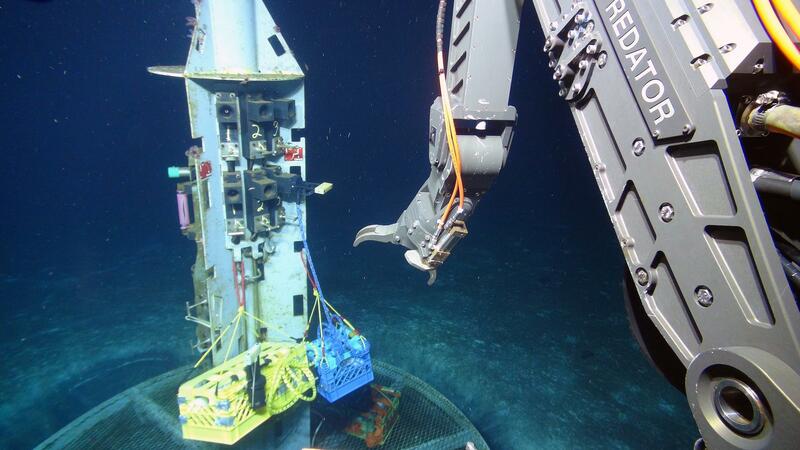 Filters prepared for collecting microbial biomass from the deep subseafloor of the Juan de Fuca Ridge flank. Photo credit M. Rappe. A new study has revealed how a group of deep-sea microbes provides clues to the evolution of life on Earth, according to a recent paper in The ISME Journal. Researchers from the University of Hawai‘i at Mānoa School of Ocean and Earth Science and Technology (SOEST) and others used cutting-edge molecular methods to study these microbes, which thrive in the hot, oxygen-free fluids that flow through Earth’s crust. Called Hydrothermarchaeota, this group of microbes lives in such an extreme environment that they have never been cultivated in a laboratory for study. A research team from the Hawai‘i Institute of Marine Biology (HIMB) in SOEST, Bigelow Laboratory for Ocean Sciences in Maine and the U.S. Department of Energy Joint Genome Institute bypassed the problem of cultivation with novel genetic sequencing methods to detect and sequence individual cells or entire natural microbial communities. They found that Hydrothermarchaeota might obtain energy by processing carbon monoxide and sulfate, which is an unexpected and previously overlooked metabolic strategy within Earth’s crust. 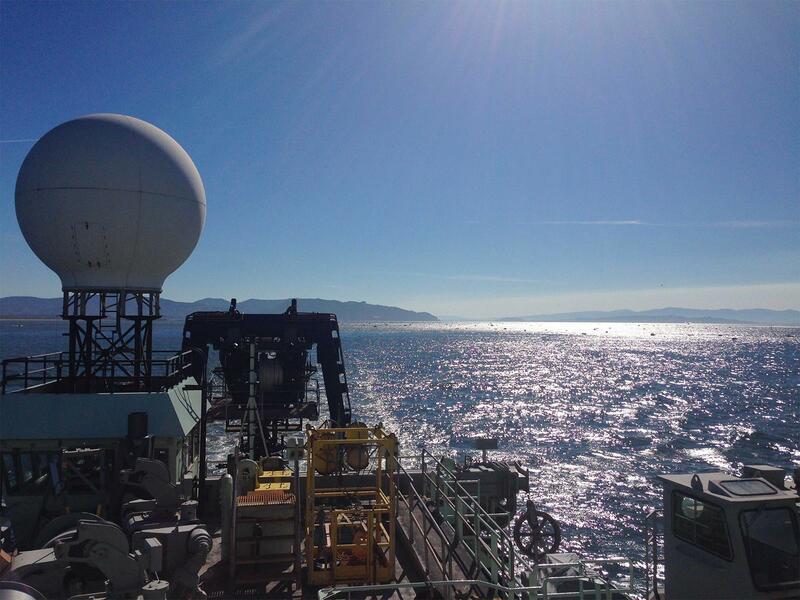 In 2011, the team of researchers sailed to the flank of the Juan de Fuca Ridge, a mid-ocean ridge off the coast of Washington where two ocean plates are separating and generating new oceanic crust. They used custom sampling equipment designed by the UH Mānoa deep subseafloor team in tandem with the Woods Hole Oceanographic Institution’s deep-diving robot Jason to travel 2.6 km to the seafloor and collect samples of the fluid that flows through the deep crust. Working in partnership with the Department of Energy’s Joint Genome Institute, the researchers sorted and analyzed the microbes in the Single Cell Genomics Center at Bigelow Laboratory. They also analyzed the microbes by metagenomics, which extracts genomic information directly from environmental samples. The findings provide the first genomic interpretations of Hydrothermarchaeota and highlight the anoxic, hot, deep marine crustal biosphere as an important habitat for understanding the evolution of early life. 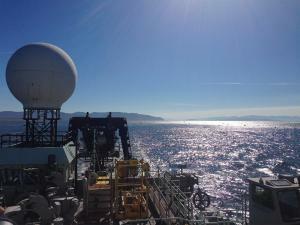 The researchers will build upon this discovery when they return to the Juan de Fuca Ridge in May 2019 to continue investigating the extreme microbes thriving below the seafloor. This work was supported by the National Science Foundation, the NASA Astrobiology Institute, the DOE Joint Genome Institute and the Center for Dark Energy Biosphere Investigations (C-DEBI). Portions of this text courtesy of Bigelow Laboratory for Ocean Sciences.